When it comes to medical billing, cashflow and efficiency, the most important decision facing clinics is the selection of the right medical billing and coding software. Billing medical claims (or physical therapy claims) is an intricate and complex process, even for individuals trained in medical billing and coding. The options are limitless, and pouring through countless online articles (and books) on the best software for medical billing is arduous and time consuming. That’s why we’ve put together this Complete Guide to Medical Billing and Coding Software, outlining the most critical areas to look for in medical billing and coding software. In 21st century health care, a precise ecosystem in which your key components work together to transmit information is vital to success. Integration is no longer a matter of convenience – it is a matter of survival. Your medical billing is dependent upon a wide variety of factors (payer type, secondary and even tertiary insurance, authorizations, eligibility, and more), all of which should be automatically assigned correctly to a claim, ready to be scrubbed and submitted to a clearinghouse. 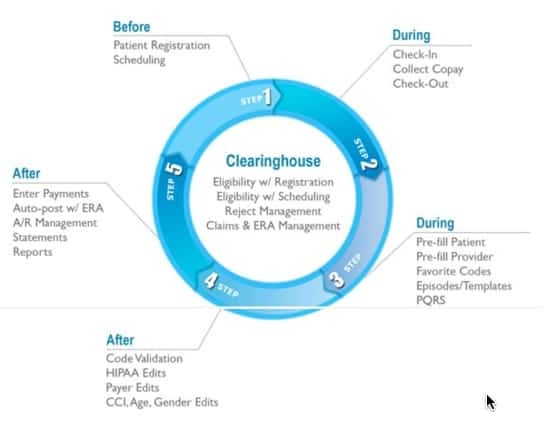 Medical billing and coding software should be directly connected to eligibility information, the practice’s scheduling component, and an ERA interface. The claim is accepted and returned directly through the software in an on-board ERA dashboard for posting. Using this method, practices can streamline the entire work flow of the patient encounter by having eligibility, chart creation, scheduling, documentation, fee schedules, pre-scrubbing, clearinghouse submissions, and ERA posting integrated into one systematic methodology. All practice’s should have software capable of running instant eligibility checks. This will help the practice determine what a patient’s insurance company will cover, how many visits a patient is entitled to, copay amounts, as well as a plethora of other useful information. This functionality should be directly connected to your medical coding and billing software interface. When possible, eligibility, scheduling, and chart creation should all happen from within the same program that billing medical claims happens in. When these two components are locked into the same system as billing and coding, a distinct advantage occurs. Once eligibility has been run, front desk personnel should have the capability to create a new or updated patient chart based upon the information and demographics found in the eligibility results. This not only saves the front desk time on entering demographics manually, but when integrated with billing and coding components also ensures that demographics found on the electronic claim form never vary from what is on file with the payer. This means fewer denials due to typographical errors or due to patients updating information with either the clinic or the insurance company, but not both. When a practice owner or clinical manager is about to compare medical billing software from one with another, clearinghouse integration is an important consideration. A completely integrated solution involves real-time, automatic syncing between the EMR software, billing software and clearing house. A biller should have the option to track the journey of each claim, from submission to payer status all the way to adjudication. The biller should be able to get information instantly, without having to call the clearinghouse or payer, and all relevant information should be displayed in an intuitive fashion within the same software. Billing staff should have the ability to easily track claims by payer, patient, provider, date, and monetary amount (down to the penny), at every step of the claim life-cycle. Should a claim be rejected at the clearinghouse level, the information on the rejection should be displayed within the billing and coding software and adjustments should be easily made and tracked with time-stamped internal notes. Once a claim is accepted and set for payment, Electronic Remittance Advice (ERA) information should always be populated automatically through the same billing software as a claim was submitted through. This ensures outstanding claim data is easily compared and contrasted with paid claim data, and leads to a verifiable AR stream. Billers should be capable of posting ERAs line by line or by batch, which automatically assigns correct dollar values against correctly itemized payment lines. AR should be a measurable metric, available at the click of a button. Time-Stamped Internal Notations & Compliance/Pre-Scrubbing Tools. Even with the best possible systems and software in place, payers will find a way to delay or deny claims. When this happens, it is imperative that billers have a tracking utility built into the same system that a claim was processed through. Each individual claim should have an area for time-stamped notations, filed by username, to properly identify who is working a claim, the status of the claim, any follow ups or reference numbers for calls with payers, etc. This makes tracking claim submission and resubmits easy and increases reimbursement. The power of payers is in the complexity of the process – simplifying this gives the power back to the biller. Medical billing software should also include tools for pre-scrubbing claims prior to submission. Using algorithms to find coding discrepancies, missing modifiers, or missing diagnosis pointers will increase first pass rates (ratio of claims being accepted and paid on their first submission) dramatically. An important automation trigger that, surprisingly, is yet to become standard in billing and coding software, Modifier Rules and Fee Schedules are time-consuming aspects of billing. These should easily be set up during the implementation phase of a new software, then easily left to work in the background. Clinicians aren’t billers or coders, and when documentation is finished and populates to billing software as a claim, modifiers should automatically populate based upon pre-programmed rules that billing staff decides upon. This same methodology should be applied to fee schedules. Since various insurance companies pay out different amounts per code, patients assigned to a specific payer should have the payer-based fee schedule automatically populate for all of their claims without the billing and coding specialist ever having to lift a finger. When the time comes to compare medical billing software solutions, always remember the key components any medical billing and coding software needs have. Billing medical claims is complex, and there are countless ways for insurance companies to deny clinics money they are rightfully owed. For more information on how In Touch EMR can simplify your scheduling, documentation, and billing, schedule a demo with us today. In Touch Biller Pro is a medical billing and coding software with unlimited support via phone, email and live chat, along with a 60 day money back guarantee. Click here to schedule a free ‘strategy’ call with the experts at In Touch Biller Pro, or call (800)-421-8442 to learn more.